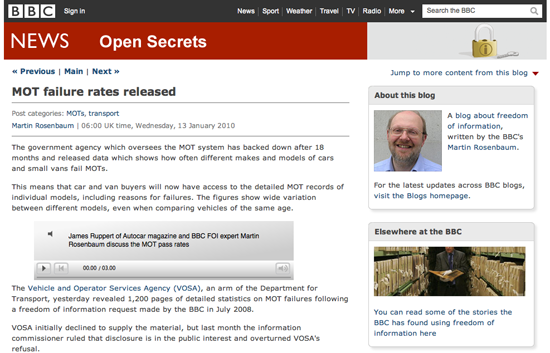 In January 2010 the BBC obtained data about the MOT pass and fail rates for different makes and models of cars. This is the test which assesses whether a car is safe and roadworthy — any car over three years old has to have an MOT test annually. We obtained the data under freedom of information following an 18-month battle with VOSA, the Department for Transport agency which oversees the MOT system. VOSA turned down our FOI request for these figures on the grounds that it would breach commercial confidentiality. It argued that it could be commercially damaging to vehicle manufacturers with high failure rates. However, we then appealed to the Information Commissioner, who ruled that disclosure of the information would be in the public interest. VOSA then released the data, 18 months after we asked for it. We analyzed the figures, focusing on the most popular models and comparing cars of the same age. This showed wide discrepancies. For example, among three year old cars, 28% of Renault Méganes failed their MOT in contrast to only 11% of Toyota Corollas. The figures were reported on television, radio and online. The data was given to us in the form of a 1,200 page PDF document, which we then had to convert into a spreadsheet to do the analysis. As well as reporting our conclusions, we published this Excel spreadsheet (with over 14,000 lines of data) on the BBC News website along with our story. This gave everyone else access to the data in a usable form. The result was that others then used this data for their own analyzes which we did not have time to do in the rush to get the story out quickly or which in some cases would have stretched our technical capabilities at the time. This included examining the failure rates for cars of other ages, comparing the records of manufacturers rather than individual models, and creating searchable databases for looking up the results of individuals models. We added links to these sites to our online news story, so our readers could get the benefit of this work. This illustrated some advantages of releasing the raw data to accompany a data-driven story. There may be exceptions (for example, if you are planning to use the data for other follow-up stories later and want to keep it to yourself meanwhile), but on the whole publishing the data has several important benefits. Your job is to find things out and tell people about them. If you’ve gone to the trouble of obtaining all the data, it’s part of your job to pass it on. Other people may spot points of significant interest which you’ve missed, or simply details that matter to them even if they weren’t important enough to feature in your story. Others can build on your work with further, more detailed analysis of the data, or different techniques for presenting or visualizing the figures, using their own ideas or technical skills which may probe the data productively in alternative ways. It’s part of incorporating accountability and transparency into the journalistic process. Others can understand your methods and check your working if they want to.